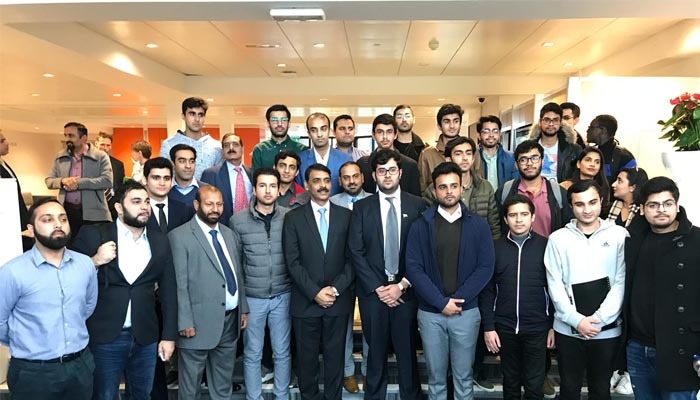 COVENTRY/WARWICK: The Director General of Public Relations (DG ISPR) Major General Asif Ghafoor has said that Pakistan is indispensably and positively relevant to the world and the future global economy passes through this part of the region. Major General Asif Ghafoor explained that there was a time not long ago when terrorists were only 60 miles away from the capital threatening to take over the capital and it was at that time when the conflict in the neighbourhood had overflown into Pakistan. He said the Army decided to take the threat of a new kind of terrorism head on and went on to sacrifice nearly 70 thousand people. “It has not been without human and financial cost. The sacrifice we have paid to restore Pakistan is huge,” he said while talking about the sacrifices Pakistan has made. The DGISPR explained the peculiarities of Western zone and said Pakistan is often misunderstood and blamed for the things that the country can never think of doing. He explained how the issues of refugees and terrorism has bogged down the country yet Pakistan has gone out of its way to help its Afghan brothers throughout by hosting them in their millions and now helping them in their rehabilitation. The DGISPR talked about three soft-pronged strategy, development initiatives, youth employment and deradicalisation. The DG showed the work done by government and the army over the last 5-6 years in this regard. He told students: “There is still much to be done in this regard. Answering a question, the DGISPR said that raising the education level in Pakistan was highly important and empowerment of the youth is critical for the progress of Pakistan. He said that in the last few years, nearly 500 youth from affected tribal areas got commissioned in Pakistan army while five times figure is being given resident student facilities at Army run schools and colleges. He said that Pakistan belonged to all its various communities including the non-Muslims. Talking about the power of youth, he said that Pakistani youth is competent, vibrant and has huge potential. He said that presently nearly 50 thousands doctors are serving in USA, similarly in other part of the world. Answering question by a student, Major General Asif Ghafoor said that demands of the Pahstoon Tahaffuz Movement (PTM) are genuine and there are genuine issues in the FATA. He said that Pakistani government is doing lots of work in the FATA and areas of KP to carry out the development work with help from the local people. He said that Pakistani state was fully aware of the issues faced by the local people while devoting itself to development work. He said that demands of the PTM were genuine but the methodology was not right.